Another surgery, another few weeks of recovery, but that doesn’t stop the longing for soup on a rainy, cold day. This recipe, from the New York Times, fit the bill. My husband helped in chopping and mixing and we worked together to put this together. I like not only the delicious lemony flavor, but that it can be made very quickly. 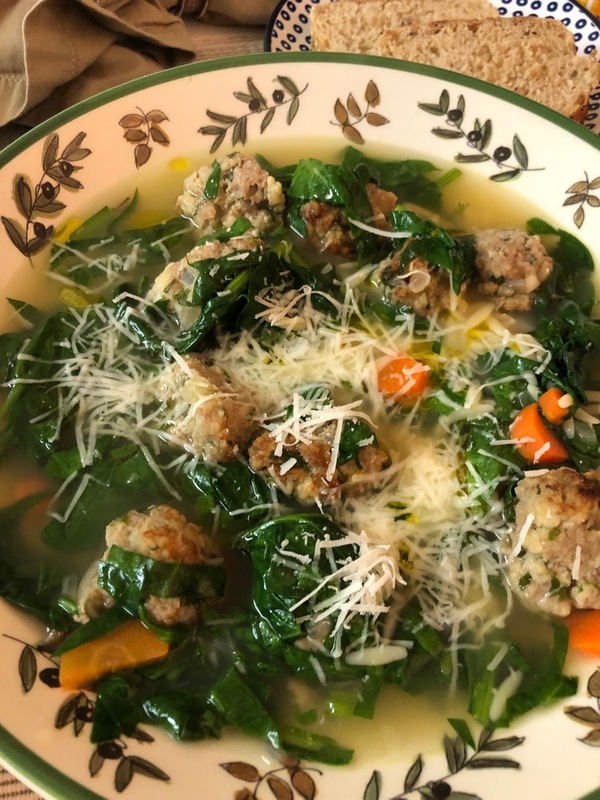 One commenter wrote: “wedding soup is not so named because it is served at Italian weddings, but because the flavors of stock and bitter greens ‘marry’ well to produce a harmony of flavors: a Minestra Maritata.” Sounds great to me. I’ve made some minor changes, reflected below in the recipe. In a large pot, melt 1 Tbls. butter then add 2 Tbls. olive oil. Saute 1/2 chopped small onion until just turning golden. Add 2 quarts (8 cups) chicken broth to the pot and bring to a boil. Meanwhile, add the turkey, panko, parsley, egg, garlic, salt, pepper and 1/2 cup Parmesan to a large bowl as well as 1/2 small onion, minced finely. Mix with a fork or clean hands until combined. 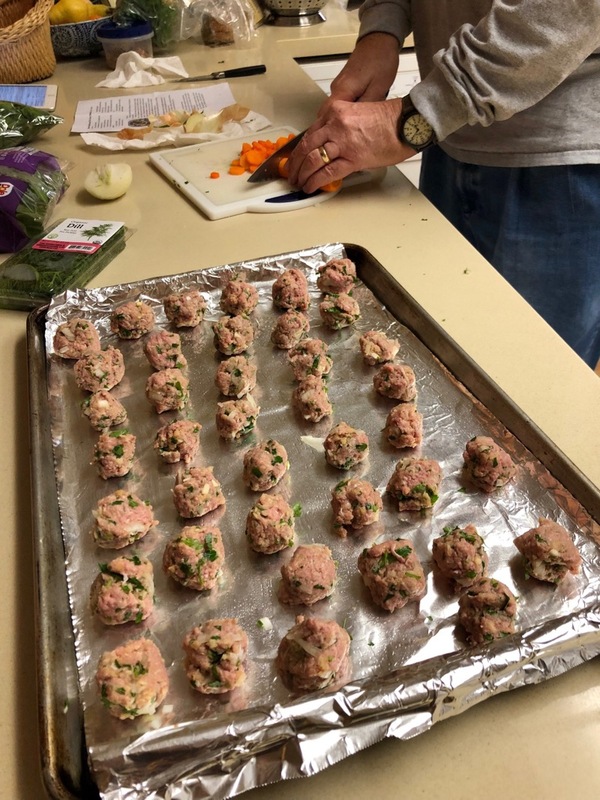 Gently roll the mixture into 12 medium (2-inch) or 20 small (1 1/2-inch) or 40 walnut-sized (our preference) meatballs and transfer to a baking sheet lined with lightly oiled aluminum foil. Heat the broiler to high and set an oven rack 3-4 inches from the heat. Broil the meatballs until brown on two sides, turning halfway through, about 5 minutes per side. Watch carefully so they don’t burn. Add the meatballs to the broth and simmer on low until completely warmed through, 3 to 5 minutes, stirring occasionally. Remove from the heat, and add the spinach and lemon zest, stirring well, to wilt. Season with salt and pepper to taste. Add coarsely chopped dill, and lemon juice. When serving the soup, drizzle each with olive oil, sprinkle with more Parmesan. Goes well with some crusty bread (heat and serve, or perhaps Mary’s Retreat Bread). Note: we added double the spinach, but Dave said it looked like an algae bloom (he’s a scientist). 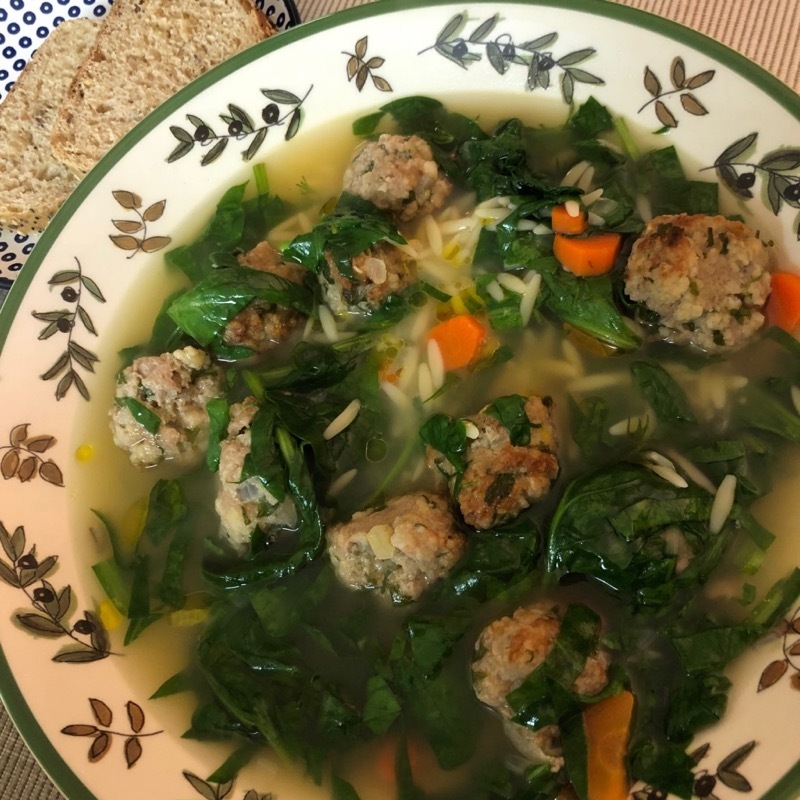 It was a better balanced flavor once we got past the greens and ate the yummy meatballs and lemony soup without excess spinach. In my recipe, I didn’t double the spinach, but you could add an extra cup, if you want.